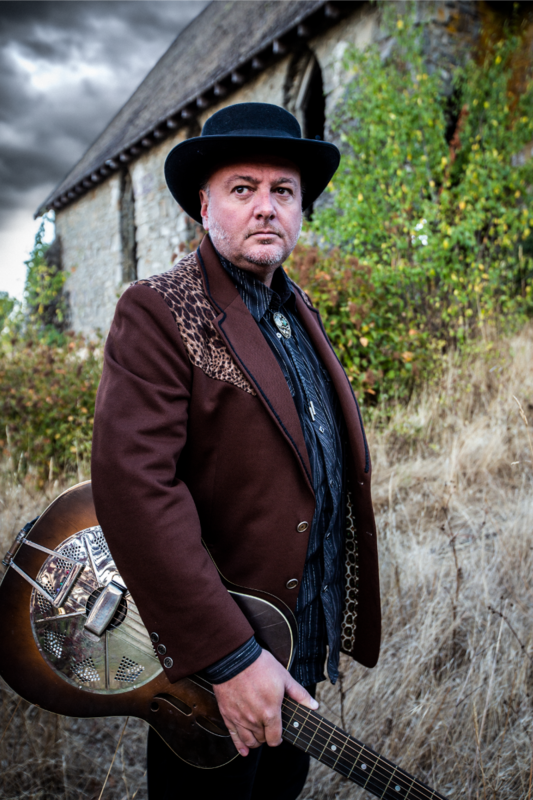 With the release of his fifteenth album 17 Vultures, bluesman David Gogo continues his blues rock crusade by pushing himself forward, yet again. Not that looking back on his career is a bad thing. He has performed on stage with the likes of BB King, Johnny Winter, Albert Collins, Bo Diddley, and Otis Rush. He has been chosen to open shows for ZZ Top, George Thorogood, The Tragically Hip, Little Feat, Jimmie Vaughan, Robert Cray, Robin Trower and Wishbone Ash. His songs are featured in films and television and have been covered by a variety of artists, most notably Buddy Guy. Never one to be pigeonholed into a strict blues category, this may be his most diverse release to date. Although initially known for his ability to rip it up on lead guitar with his electric performances, Gogo has also built up a solid reputation over the last decade as an acoustic performer with his solo shows that feature his vintage National steel guitar chops, as well as his entertaining stories from the road. Usually he keeps these two sides of his abilities separate, but he features both on the new album. This was the approach that Gogo took during the writing and recording of 17 Vultures. Backed by a core rhythm section of Pat Steward on drums (Bryan Adams, The Odds, Colin James, Jimmy Barnes) and Ben Dwyer (son of jazz legend Phil Dwyer) on electric and upright bass, the collection of songs range from traditional blues to very heavy contemporary influences. Along with five new original songs by Gogo, the choice of cover songs are an interesting variety with cuts by The Beatles, Barbecue Bob, Doug And The Slugs, and Bob Dylan! The original songs are some of the strongest of Gogo’s career. Thanks For The Distraction is a solid rocker with echoes of The Black Crowes and The Rolling Stones, with killer harmony vocals by guest Tina Jones. Title track 17 Vultures was in gestation for almost a year before its completion. Musically influenced by Mark Lanegan, Jeff Beck, and Nick Cave, the lyrics were written and re-written during Gogo’s travels and reflect on the beauty and pain of a life spent on the road. Sulfite Boogie is a fun blues rocker featuring guest artists Monkeyjunk. The blending of Gogo’s voice and guitar with this tight, well-oiled band has spectacular results! Too Good To Be True is a straight-ahead rock and roll song that brings Nick Lowe and Rockpile to mind. The pursuit of romance and the acceptance of disappointing results are seen through the eyes of an experienced man. The album’s closer Shake My Head shows the growth of Gogo as a songwriter. Born and raised on Vancouver Island on the west coast of Canada and being in the music business for his entire life, Gogo tackles the difficult subject of the opioid crisis that affects nearby communities and people in the music scene. Not an easy job. Once the lyrics say what they need to say, he lets his guitar take over the raw emotion of the song. Overall the album is an entertaining and diverse listen, and gives Gogo another strong batch of material to add to his many live performances!